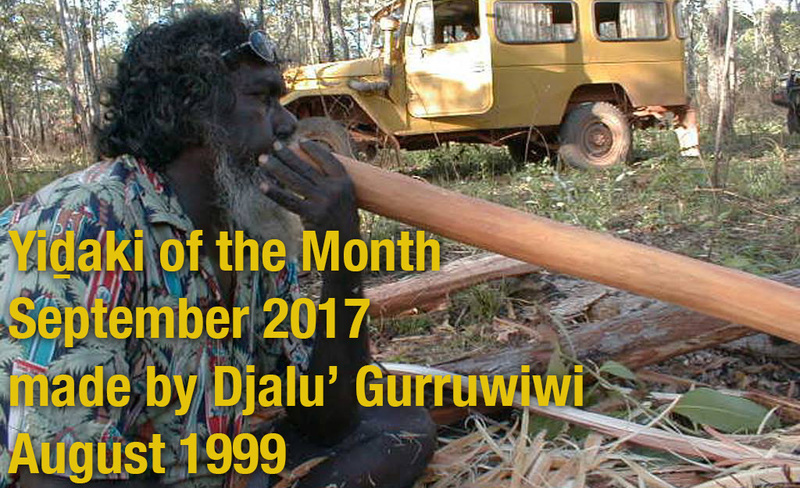 Djalu’ Gurruwiwi made this yidaki in August 1999. I helped in between taking pictures for my website documenting my first visit to Australia. I’ll repeat of few of those old photos in higher resolution here. 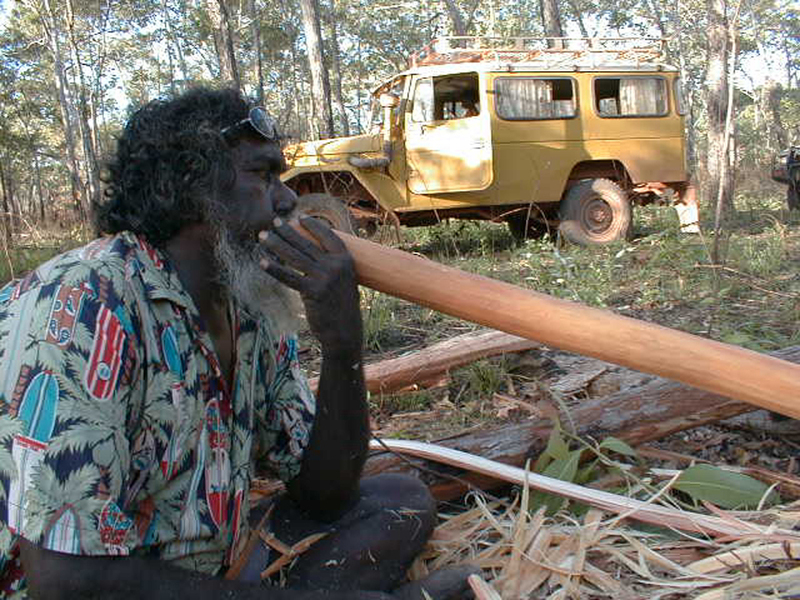 I don’t have video of any Yolŋu playing this yidaki like I did of the last Yidaki of the Month. Instead I have about 40 minutes of audio of Djalu’ playing it. Apart from a couple of excerpts in Yiḏakiwuy Dhäwu Miwatjŋurunydja and a few Mulka Project videos, these recordings have only been heard by a few of my friends. And now, the “making of” photos. In the finest digital photo quality 1999 had to offer! 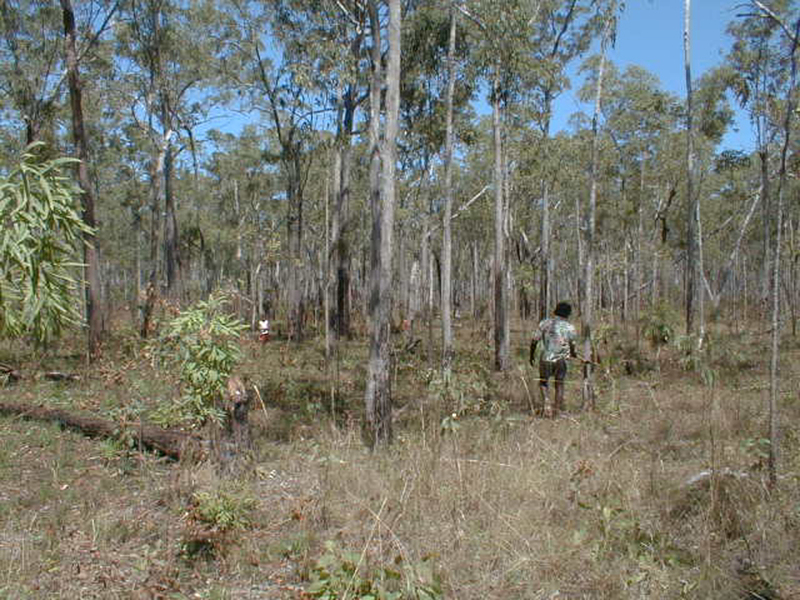 Heading out into the stringybark forest near Gove airport one fine day in August, 1999. 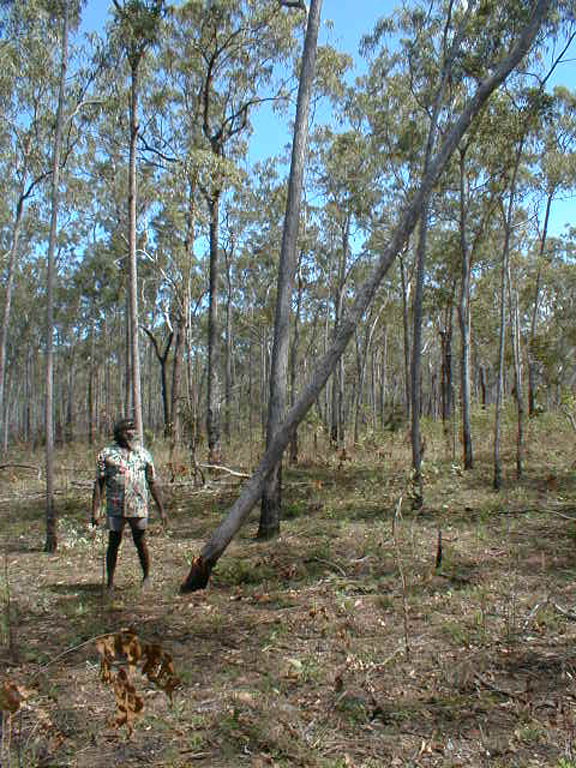 Djalu’ is tapping this tree with the head of his axe to listen for the resonance of a hollow tree. The tree falls. This isn’t our Yiḏaki of the Month, but it’s from the right day and I love this photo too much. A little clearing in the mouthpiece end. And in the bottom end. One last play before loading up in his old 4WD. Yolŋu love this first part of discovering new yiḏaki. This was one of two that day that Djalu’ loved so much, he almost finished them on the spot. 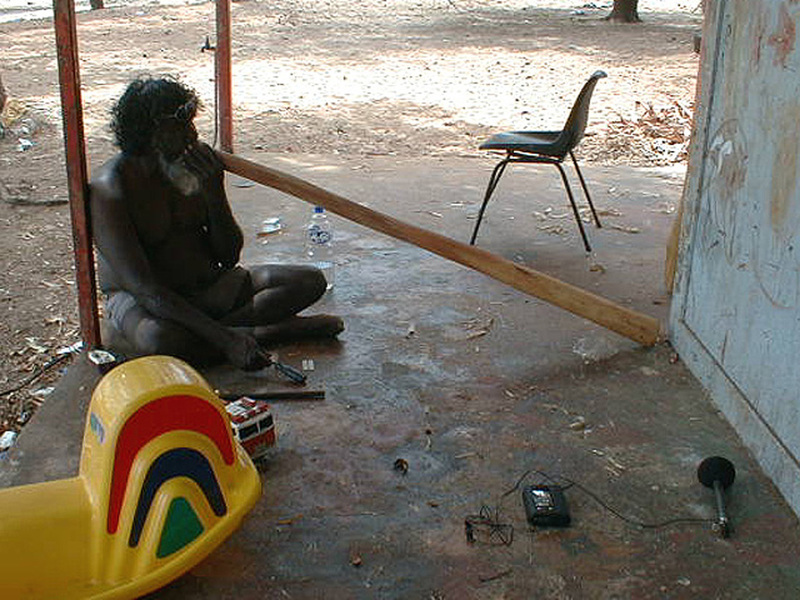 Djalu’ plays on his back porch for my old DAT recorder (RIP). I’ll post more below, but let’s listen to just one bit now, shall we? His rapid alternation of drone and trumpet notes totally mystified me back then, so this has always been my go-to demo of how amazing the old man’s playing is. 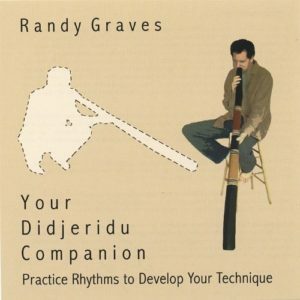 An excerpt of this track appears on the Yiḏakiwuy Dhäwu How to Play: The Trumpet Note page, but I’ll include the full three minutes here. He plays a few renditions and provides the “mouth sounds,” or teaching pneumonics. This yidaki part normally accompanies song and dance about monsoonal rains. 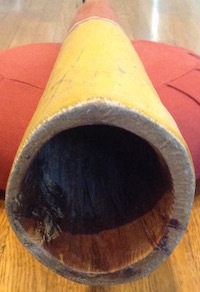 The yiḏaki in question, at left, drying after a coating of glue. Painting is a family affair. 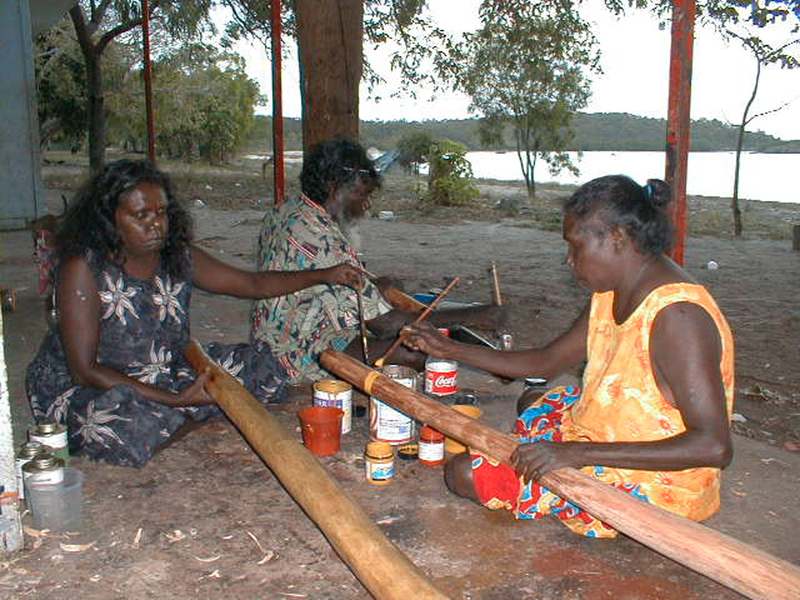 Djalu’ and a sister paint other instruments while his wife Dopiya (right) paints our Yiḏaki of the Month. The three yiḏaki I brought home from my first visit. Paint drying the night before we chucked them into a plane hold wrapped in a sheet! Confession. While the Yiḏaki of the Month was Djalu’s clear favorite of the three, I couldn’t get along with it for many years. I preferred the black one at the right. 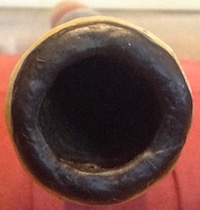 It had a tighter top section, more back pressure, and a larger interval between the drone and trumpeted note. I didn’t know how to play trumpet notes with any subtlety back then. I almost always pushed too hard, with too tight a lip, and overshot the trumpet note on Djalu’s favored yidaki of the batch. Yet he demonstrated hitting it with such ease in the piece you heard above. I struggled to play along with his recordings and learn, but just couldn’t connect with the yellow yidaki. 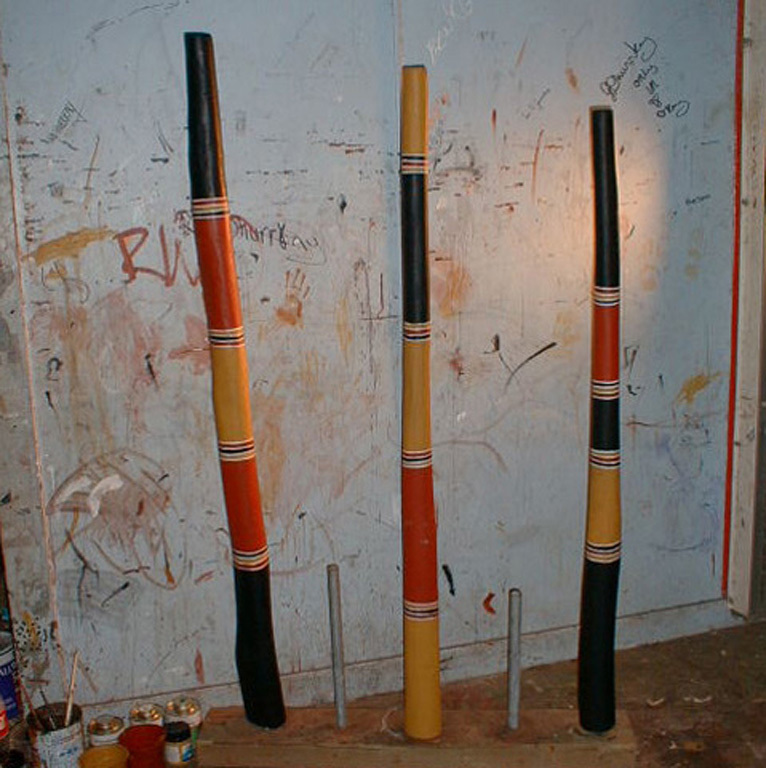 I always used the black one to demonstrate what I had learned of Yolŋu style, right up to when I moved to Arnhem Land. The black one graced the covers of all my instructional CDs and appeared on the retroflexed tonguing exercises. 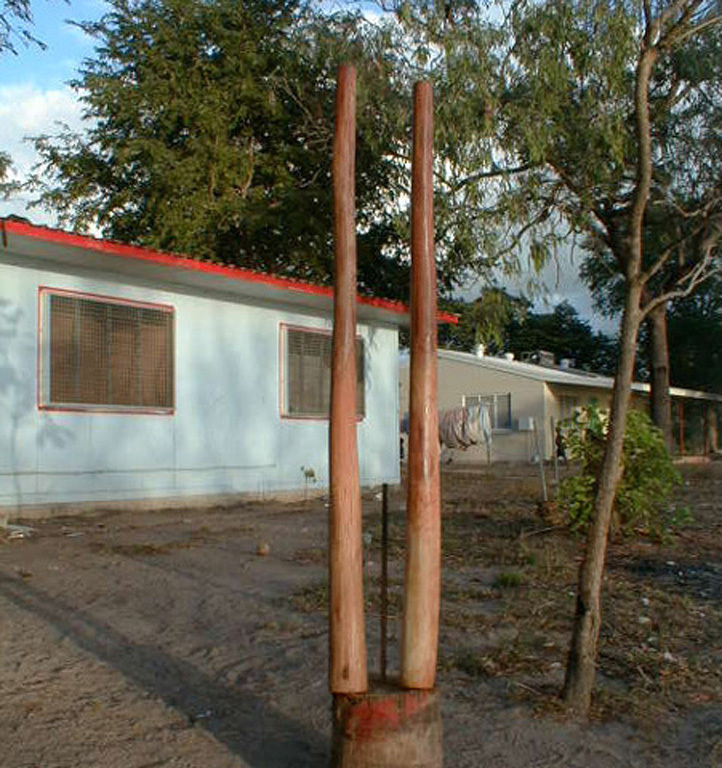 These yidaki all stayed in the USA while I lived in Arnhem Land. After living for five years near Djalu’ and developing my playing style and lip with his and other Yolŋu players’ influence, guess what? I now very much prefer the yellow one. 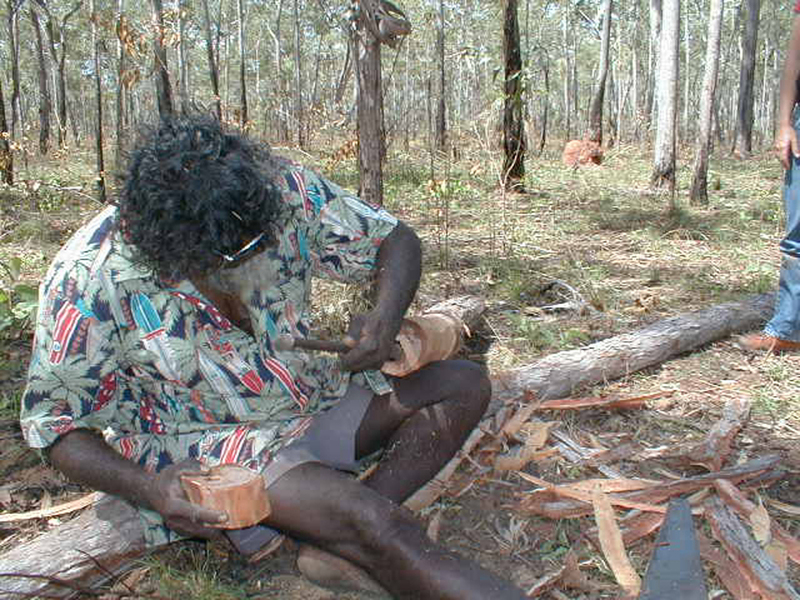 Young Yolŋu probably would prefer the black one with its higher back pressure. I guess I’m an old man like Djalu’ now, preferring mid-level back pressure and a slightly more open bore. 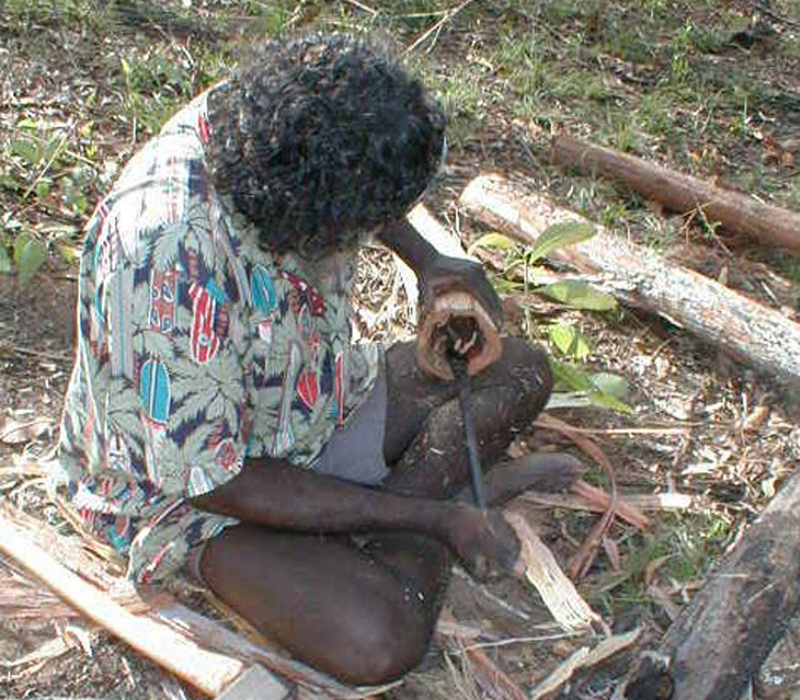 Here are a few more recordings of Djalu’ playing it. A very warm presentation by you and Djalu. I feel as though I’m right there with you both. Next PostNext Women and Didgeridoo. Again.